Margaret Thatcher remains a controversial figure in her native Britain. On one hand, she is blamed for decimating “traditional industries,” destroying many local communities and their livelihoods, and introducing dangerous deregulations the economy. On the other hand, she is remembered for saving Britain from its disturbing decline in the 1970s – which saw three-day-work-weeks due to lack of electricity and utilities, stagflation, and trade union militancy undermining successive democratically elected British governments, and an embarrassing IMF bailout in 1976. A belief in free-market economics, and a dislike for socialism saw her push through a radical restructuring of British industry, including the privatization of a huge chunk of Britain’s state companies, the wisdom of which continues to be debated to this day. Given this track record, it was curious to see that the major Chinese Communist Party media outlets featured respectful obituaries of Thatcher on their websites. Additionally, President Xi Jinping, Chinese Premier Li Keqiang, and Hong Kong Chief Executive CY Leung expressed condolences following her death. 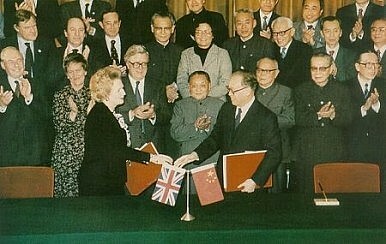 The main explanation for bestowing this admiration on someone whose policies contradict China’s official communist ideology was that Margaret Thatcher was responsible for agreeing to and formalizing the handover of both Hong Kong Island and the New Territories to China – and indeed the Chinese media has focused on this event. Hong Kong Island had been ceded in perpetuity, unlike the lease on the new territories which ran out in 1997. However, Thatcher pragmatically arranged for both to be returned to China following her negotiations with Deng Xiaoping. We could however, speculate about another possible reason for the plaudits for Thatcher. It could be that some in China feel there may be something to identify with in either the policies she implemented during her time as British Prime Minister, or at least her ability to overcome opposition to her reform agenda. Of course, China does not have any serious trade unions to worry about. Although a few well publicized strikes have taken place in which workers demanded better wages and conditions, in general China’s workforce remains docile, in no small part because of China’s “toothless” trade union system. On the other hand, Thatcher’s privatization of powerful but inefficient state owned enterprises (SOEs) has great relevance for Chinese leaders today. As in the Britain Thatcher inherited, China’s economy is being severely distorted by some SOEs who are chronically inefficient and who would be unable to turn a profit without heavy state subsidies. China’s need to grow consumption as a share of GDP requires that more wealth or spending power be shifted to Chinese households. Although not widely discussed, further privatization would be an effective if painful way to do this. Margaret Thatcher pushed policies which resulted in privatization in the telecoms, gas, steel, rail, mining (esp. coal), passenger air-travel and power sectors. The resulting job losses and disruption in wide part explain the mixed views on her legacy today. Thatcher’s ability to communicate her policies clearly (and forcefully) and hold course despite all the opposition they triggered was really her true strength. In China today, former President Jiang Zemin and Premiers Li Peng and Zhu Rongji’s time in office is also remembered with mixed feelings. The reforms of SOEs they pushed through in the 1990s helped to improve efficiency and to set up China’s economy for its impressive growth over the last decade, yet the resulting job losses leave many with bitter memories. Now, often inefficient state-owned (or state-controlled) enterprises are still dominating key areas of China’s economy, crowding out some private sector efficiency and access to finance, especially since the 2008 Global Financial Crisis (in a phenomenon known as “the state advances, the private sector retreats” 国进民退). As Thatcher experienced first-hand, reforms always generate opposition, especially from those who are set to personally lose from them. If President Xi and Premier Li are to deliver on their promises about reform there is sure to be resistance from vested interests both within and outside the Party. Some would argue that China is again in need of some Thatcher-style “bitter medicine,” and if it is to get it, it will need some Thatcher-style political will to stay the course from the new leadership.